From the acclaimed military historian, a new history of the outbreak of World War I—from the breakdown of diplomacy to the dramatic battles that occurred before the war bogged down in the trenches World War I immediately evokes images of the trenches—grinding, halting battles that sacrificed millions of lives for no territory or visible gain. Yet the first months of the war, from the German invasion of Belgium to the Marne to Ypres, were utterly different—full of advances and retreats, tactical maneuvering, and significant gains and losses. 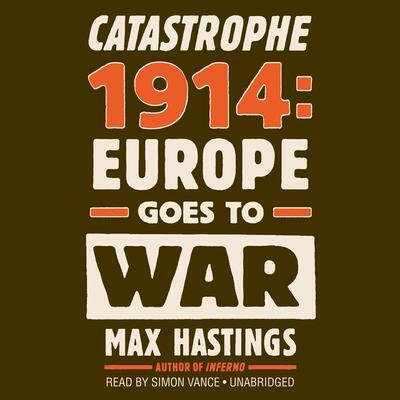 In Catastrophe 1914, Max Hastings re-creates this dramatic year, from the diplomatic crisis to the fighting in Belgium and France on the western front and Serbia and Galicia to the east. He gives vivid accounts of the battles and frank assessments of generals and political leaders, and shows why it was inevitable that this first war among modern industrial nations could not produce a decisive victory, resulting in a war of attrition. Throughout we encounter high officials and average soldiers, as well as civilians on the home front, giving us a vivid portrait of how a continent became embroiled in a war that would change everything.